The name Gingerman may be quirky, but there is serious gastronomic stuff going on at Ben McKellar's intimate Norfolk Square restaurant just up from the seafront on the border between Brighton and Hove. The ethos behind the place is to offer bright modern flavours, great value and food that people want to eat – rather than what chefs feel like cooking. As a result the kitchen is bold enough to offer roast beef on dripping toast and horseradish as a starter alongside a warm salad of local scallops and Normandy boudin noir. Likewise, main courses could embrace anything from Boyton Farm Tamworth pig with champ, perry and sage to roast monkfish with potatoes cooked in chilli, tomato and mustard seeds with caraway jus. 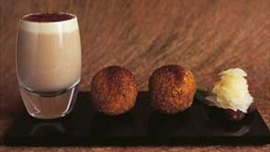 Desserts are equally broad-minded, spanning everything from spiced apple turnover with Calvados sauce to hot chocolate soufflé with pistachio ice cream. 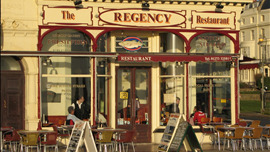 There are great seafront views to be enjoyed from the legendary Regency restaurant, which has been a stalwart of the Brighton scene since the 1930s. Terre à Terre Vegetarian restaurant has been breaking rules and re-defining the genre since it opened as a BYO café just off Brighton seafront an age ago, scooping 'Best for Vegetarian' at the Observer Food Monthly Awards 2008 and becoming a shining star on the Brighton and Hove restaurant scene.